Looking for a USED ADAPTIVE? Adaptive Robot Control activates a closed metrology-driven feedback loop that firmly increases the precision of industrial robots. 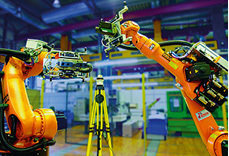 Regardless whether robots are deployed for machining, inspection, applying beads or manipulating objects, roboting tasks are consequently executed with 0.1mm absolute accuracy, irrespective of degrading phenomena like play, mechanical flexibility, backlash or thermal effects. Looking to Purchase a New NIKON ADAPTIVE?